The CIA brings healthy, modern, and flavorful cooking techniques and recipes to home cooks everywhere The Culinary Institute of America's Healthy Cooking at Home brings vibrant, modern, flavorful cooking techniques to the health-minded home cook. Familiar favorites like Chicken Burritos are remade the healthy way, and exotic dishes like Pumpkin, Zucchini, and Chickpea Tagine show how exciting to the palate healthful food can be. 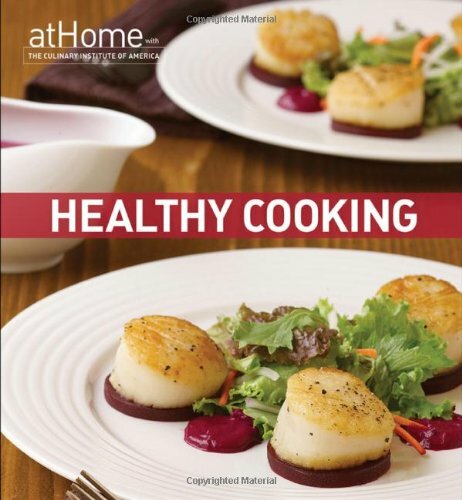 With step-by-step techniques from the experts at the CIA, plus detailed information on nutrition and ingredients and lavish full-color photographs throughout, this is the essential guide to cooking tasty, healthy food at home. * More than 235 recipes, ranging from casual lunch fare and easy weeknight dinners to luxurious, succulent modern cuisine * Recipes include quick and simple dishes like Black Bean Burgers and exciting and distinctive fare like Grilled Quail Wrapped in Prosciutto with Figs and Wild Mushrooms * Features 80 vibrant, dramatic photos that illustrate the richness and variety of recipes and teach simple step-by-step techniques * Recipes are based on the new USDA food guide pyramid and the latest dietary guidelines, doctor recommendations, and research in health and fitness Healthy Cooking at Home is ideal for home cooks of all skill levels who want to keep the entire family healthy, happy, and well fed.